I'm sitting in my bed looking at my two daughters (who love to take over my bed each night a few hours after they go to sleep) and I couldn't be more...confused, happy, in awe. How did I get here? I remember being a little girl who was excited about finally being tall enough to see what was on the counter in my mom's kitchen. I remember making my first friend, Ashley Doltan, and riding my bike to her house. I remember meeting Mark and when we found out Ada was coming and now I am going to be twenty six in a week. I don't feel old. I don't feel sad about my birthday or age. I do feel a little like I'm at the top of a hill though, looking back at my past and seeing also the path ahead of me. I feel good. I am blessed beyond any of the images I could have pictured for my life at this time. I certainly wouldn't have thought I would be married or have two daughters. I own two dogs! What the hell? Haha, really, things are great. I hope this year is my best so far. I feel like I have a LOT of patients to learn for my daughters and a lot of love to give to my family and friends. Bell sleeps anywhere the sun is shining. These are some of the last of my plants...I potted them and and saving them in the garage to replant next year. Ada and her bubbles... never ending. Ada likes to go on dates with her dad. 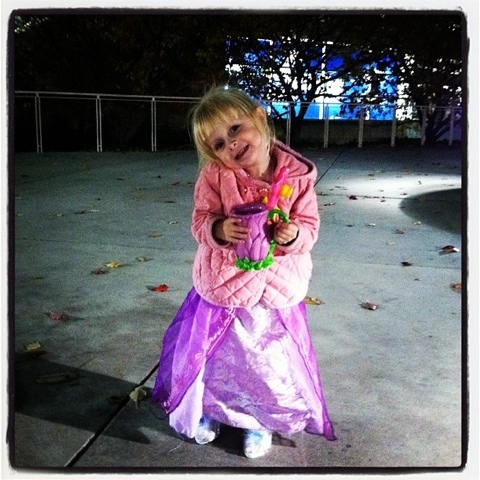 This time they went to Disney on Ice. Mark took her last year and she loved it so he thought they'd try it again this year. Hannah was wishing she could go too but she isn't quite old enough. Next year baby girl! 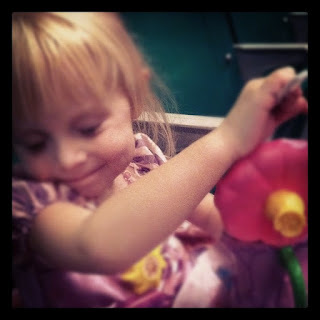 Mark took this photo of Ada enjoying a huge snow cone in a Tinkerbell mug. She came home in Cinderella's glass slippers and she even brought Hannah a Cinderella GusGus mouse doll, so thoughtful. Gracie is a married woman. Twas the night before Gracie's big day and all through my house was my busy hands working to make 60 caramel apples. They turned out pretty and delicious...all done at four in the morning. I woke up bright and early at 6. The girls and I put on our party shoes and thank god my brother stopped over early to help me out with the little monsters. This is my mom, Ada and I before the wedding. This is their cute wedding cake. Ada stood by the cake the whole time waiting for the first piece. She was ready to cut into it herself but thankfully she waited. Worth the wait . This is Ada and my big brother Dustin. This is my sister and my grandparents. Gracie and Joey drove away in this sweet ride! Same one Mark and I left our reception in. Ada loved the whole day, here she is planning out her future princess wedding. By the time we got back home I was the only one still awake. Start with cookie dough and a separate bowl of cinnamon and sugar. Roll dough into balls and then coat with the cinnamon sugar mixture. Cream shortening, sugar and eggs. Add cream of tartar, baking soda and salt. Combine sugar and cinnamon in a separate bowl. Roll dough into small balls and then roll the balls in cinnamon sugar mixture. Place on baking sheet, press down a bit so the cookies won't be too plump. Or you can wait until after they are baked and press with a spatula and then let cool before removing. The ingredients for this lasagna are in three parts. A meat mixture: pasta sauce, and cooked ground italian sausage. A cheese mixture: cottage cheese, eggs, parsley, parmesan cheese. A cheese and spinach mixture: cottage cheese, eggs, parsley, parmesan cheese and chopped spinach. In a large prepared pan layer noodles, meat mixture, cheese mixture, and the mozzarella cheese three times. If making spinach lasagna, layer noodles, pasta sauce, cheese and spinach mixture, and the mozzarella cheese three times. Brown the italian sausage and drain. Simmer in pasta sauce while preparing other ingredients. Cook 12 lasagna noodles according to package. Drain and set aside. Combine one pound of cottage cheese, 3 eggs, half a cup of parmesan cheese and 2 teaspoons of parsley. Spray a large glass baking dish with nonstick spray and layer noodles, meat mixture, cottage cheese mixture and mozzarella cheese three times. Spray a large glass baking dish with nonstick spray and layer noodles, pasta sauce, cottage cheese and spinach mixture and mozzarella cheese three times. Boil chicken breasts in chicken stock with chicken bullion and shred, set aside. Dice potatoes, cut broccoli, and dice carrots. Mix flour and butter in a separate bowl. Boil all vegetables in chicken stock (the pot that was used to boil chicken). Add the flour mixture, milk and shredded chicken to the pot. Fill two regular sized pie crusts. Or in this case, one crust and five smaller pie crusts. Add the top shell. Score to allow heat to escape. If making blueberry pie, add fresh blueberries, sugar, cornstarch, salt, cinnamon and butter. Cover these pies with a top shell and score to allow heat to escape. Big girls approve of these. Add vegetables to chicken stock and boil until soft. Mix flour and butter in separate bowl. Add flour and butter mixture to pot and then add milk to thicken. Pour into two large pie crusts. Add top shell and core to allow heat to escape. Mix first four ingredients in a bowl then add blueberries and lightly stir. Pour mixture into pie crust and add slices of butter. Cover with top shell and score to allow heat to escape. For a large pie bake at 425 degrees F for 50 minutes. Mix flour, salt, soft butter and shortening...by hand, seriously. When halfway mixed wet your hands at the sink and continue mixing. You will need to wet your hands 3 or 4 more times. Then add iced water a tablespoon at a time and work into the dough with a fork. Roll the dough into a ball and wrap in plastic wrap. Let this dough sit in the fridge to chill. When I make this recipe it usually provides me with enough dough for two top and two bottom crusts. Here's the disclaimer... When I made the blueberry pies pictured, I did not make a whole pie, I made three small ones. So I used my math skills and intuition and just cut the recipe down. Hope you find what works for you and enjoy these recipes.